27th December 1935: the IRA raid on Campbell College OTC Armoury. The IRA raid on the Campbell College OTC armoury on the night of Friday 27th December 1935 had repercussions that were to echo through the next decade and beyond. The suggestion to raid the OTC armoury had come from GHQ in Dublin, where Moss Twomey was Chief of Staff and Sean McBride, Tom Barry, Sean Russell and Stephen Hayes were all active. The previous few years, including the Outdoor Relief Riots and then the mini pogrom of the summer of 1935 had shown up the limitations of the IRA’s arms stocks in Belfast. Since the dump arms order at the end of the Civil War, the IRA had not officially engaged in offensive operations in the north beyond those occasional arms raids, mainly to replenish stocks captured by the northern government. The IRA’s response to the aftermath of the raid was to lead to the imprisonment of its Adjutant General Jim Killeen and Donegal O/C (officer commanding) Sean McCool, two GHQ opponents of Russell’s proposed bombing campaign in Britain. Buried somewhere in the fog around the Stephen Hayes affair, was his chief prosecutor, Sean McCaughey, who had participated in the raid. GHQ’s role in proposing the raid may have figured somewhere in McCaughey’s mind. More locally, in Belfast, the raid marked the politicisation of sentencing policy. Through to the 1940s, a conviction in a northern court for illegal possession of a revolver attracted a fine of £2 or £5 depending on whether it was loaded or not. However that tariff only applied if you were a unionist. If you were a republican, from 1936, a similar conviction brought a sentence of ten years or more. The plan for the Campbell College raid was for an IRA unit to seize the gate lodge, tie up the occupants and dismantle the telephone lines. The IRA unit was composed of eight volunteers from different companies in Ulster No 1 Area (the IRA’s designation for the Belfast district), including Ballymacarrett (Eddie McCartney), Ardoyne (Sean McCaughey) and the Falls (Peter Fanning). The volunteers were to assemble at three mobilisation points and then, acting as sections, move into positions for the raid which was to begin at 8.30pm on Friday night. 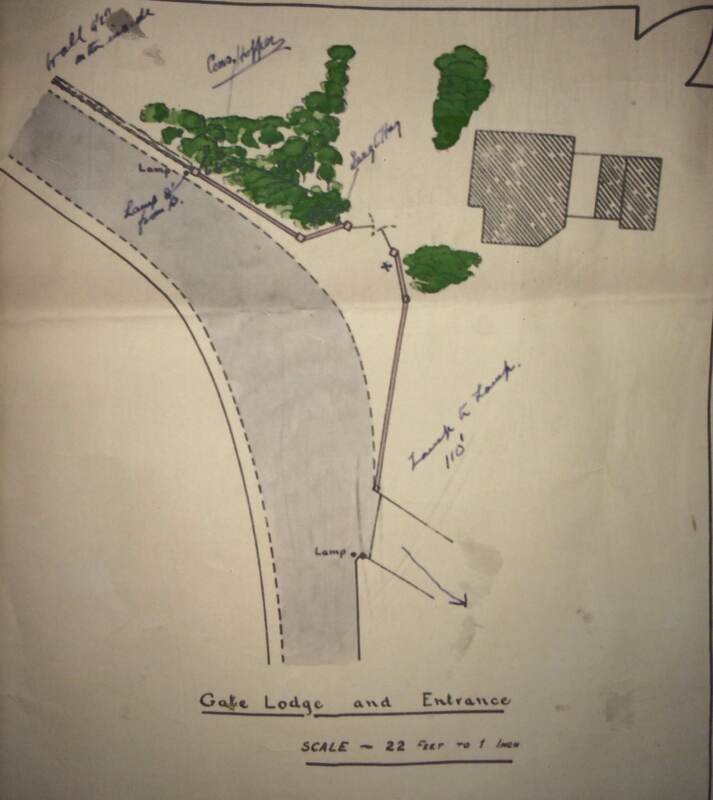 Once the gate lodge had been secured, the unit would use a scouting car and a commandeered car and strip out the 200 rifles in the OTC armoury and move them to IRA arms dumps which were to be organised by the Quartermaster, Charlie McGlade and command staff like Tony Lavery, who was O/C of Ulster No 1 area and Jimmy Steele, who was Adjutant. The use of cars would be a step up from the previous year when arms netted in the Ballymena raid were transferred to the Falls in a horse and cart. Members of the IRA unit travelled out on the tram to Belmont Road from High Street. They then walked down Belmont Road and then down Hawthornden Road, when they split up into smaller groups. One section assembled at the gates on Hawthornden Road and took up positions outside the gate. A second section then arrived, checked the time with the first section, then passed through the gate and went to the gate lodge door. It was now 8.30pm. At the gate lodge they pulled scarves up and tucked them under their caps, concealing their faces. An IRA volunteer then knocked on the door of the gate lodge. Inside the gate-lodge were William ‘Billy’ Hope, his wife Cassie, daughter Jean and two grandchildren. Hope was a renowned piper, making and playing both the uilleann pipes and highland pipes, he also had a pipe shop on Agnes Street. Hope taught various pipe bands and knew the renowned cultural nationalist FJ Biggar as early as the 1900s, as well as a wide circle of people involved in pipe and fiddle music across Belfast and further afield. Hope was so taken with Biggar that he even named one of his sons Francis Joseph Biggar Hope. He was pipe instructor at Campbell College and lived in the gate-lodge with his wife and some of his children. He also taught woodwork in the College. Billy Hope also proudly claimed he was a direct descendant of Jemmy Hope, the United Irishman (another son was called James White Hope). A Cumann na mBan member, Winnie McGuinness was also married to a house painter called Bobby Hope from the Shankill Road in Belfast who Harry White states also claimed descent from Jemmy Hope and so may well have been a relative of Billy Hope. Hope’s musical contacts are likely to have included senior Belfast IRA figures like Jim Johnston who organized the Craobh Ruadh Pipe Band. This may even have meant that the IRA had been able to use him as a source of information on the OTC armoury at Campbell College, either with or without his knowledge. That would also explain why his gate-lodge was the one being targeted in the raid. In this context, his apparent pride in his descent from Jemmy Hope hints at a certain political sensibility, although there is no reason to believe that it may have extended to any sympathy towards Irish republicanism, never mind facilitating an arms raid by the IRA. Inside the gate lodge, Hope was sat in the kitchen with Cassie, Jean and two of Jean’s children. Hearing the knock on the door, Jean left the kitchen and went to answer it. She opened the door to find three men who had each masked their face with a handkerchief. They were standing one behind the other and each was pointing a revolver at her. One thing that all accounts of the raid agree upon is that, at that exact point, Jean Getty screamed. For the next few minutes, confusion reigned. The first two IRA volunteers entered the little hallway behind Jean and followed her into the kitchen while a third paused at the door, then entered and followed them into the kitchen (the RUC later claimed the third IRA volunteer was Bernard Rooney). In the hall, the kitchen door was directly opposite the front door while a doorway into the parlour was on the left. The O/C of the IRA section told Jean Getty to stay quiet as they were not going to harm her. Billy Hope was sitting on a chair with his shoes off, Cassie, Jean Getty and her children were all sat down. They then asked if there was anyone else in the house and Getty and Billy Hope both said “No”. The IRA commander then said to the one at the back to go and close the front door while he and the other IRA volunteers stood, revolvers in hand, in the kitchen. RUC Constable Ian Hay had been on duty in the grounds of Campbell College, on the opposite side of the entrance road from the gate lodge. Hay moved towards the gate lodge on hearing the scream, and had about ten to twelve metres to cross from cover in the bushes to the door of the gate lodge. RUC Head Inspector Reid was also there and, after delaying for a moment, followed Hay to the gate lodge. At the same time the scream seems to have drawn the attention of the IRA section at the gate. Hay had to pass within five metres of the IRA volunteers at the gate, and they saw him as he approached the gate lodge. One volunteer opened fire with a revolver hitting Hay on the arm. As Hay reached the gate-lodge door, he then saw that the third IRA volunteer, who had stayed outside for a minute, was now visible just inside the hall where he was going to close the door. The IRA volunteer in the hallway shouted a warning and then retreated back inside to the kitchen. As Hay’s momentum carried him into the hall and then the kitchen, he came face-to-face with the IRA volunteers inside. The kitchen, which measured about three and half metres by three metres, now contained Billy and Cassie Hope, Jean Getty and her two children, RUC Constable Ian Hay and three IRA volunteers. Both Hay and the IRA volunteers opened fired at each other with their revolvers at what must then have been a range of less than three and half metres across the kitchen. Hay was hit by four bullets and had fired off all six rounds from his revolver. Hay was later to claim that he shot one IRA volunteer in the stomach, just as he was about to fire on Hay, the IRA volunteer then dropped his fully-loaded revolver after being shot. Layout of the gate lodge occupied by the Hopes. From trial documents. The IRA section then retreated back through a curtain that covered a doorway at the opposite end of the kitchen from the hall. This door led back into a scullery containing a pantry (to the right) and, to the left, stairs and passageway down to a back bedroom. There was also a door out to the rear of the gate lodge. Hay followed the IRA volunteers through the curtain but found that they weren’t in the scullery and the door was locked. He reloaded his revolver then returned back into the kitchen, keeping guard over the curtain into the scullery. Head Inspector Reid had followed Hay into the gate-lodge and, leaving Hay in the kitchen, quickly searched the rest of the interior to confirm the IRA volunteers had left. All sources agree that the back door was still barred from the inside (but no-one actually explains how the IRA volunteers actually escaped). Hay then lay down on a couch to await an ambulance. RUC Constable Hopper was also close to the Hawthornden Road gate (about ten metres further away from the gate lodge than Hay). Hopper had observed IRA volunteers around the gate. Once they opened fire on Hay at the front door of the gate-lodge, Hopper returned fire towards the IRA section at the gate and what he claims were further IRA volunteers located further up Hawthornden Road. All three IRA volunteers who had been in the gate lodge then rejoined the section at the Hawthornden Road gate. They conferred and quickly decided to call off the raid. The combined IRA sections then continued firing to cover their escape route towards Belmont Road. They had 350 metres to cover to reach the junction with Belmont Road. 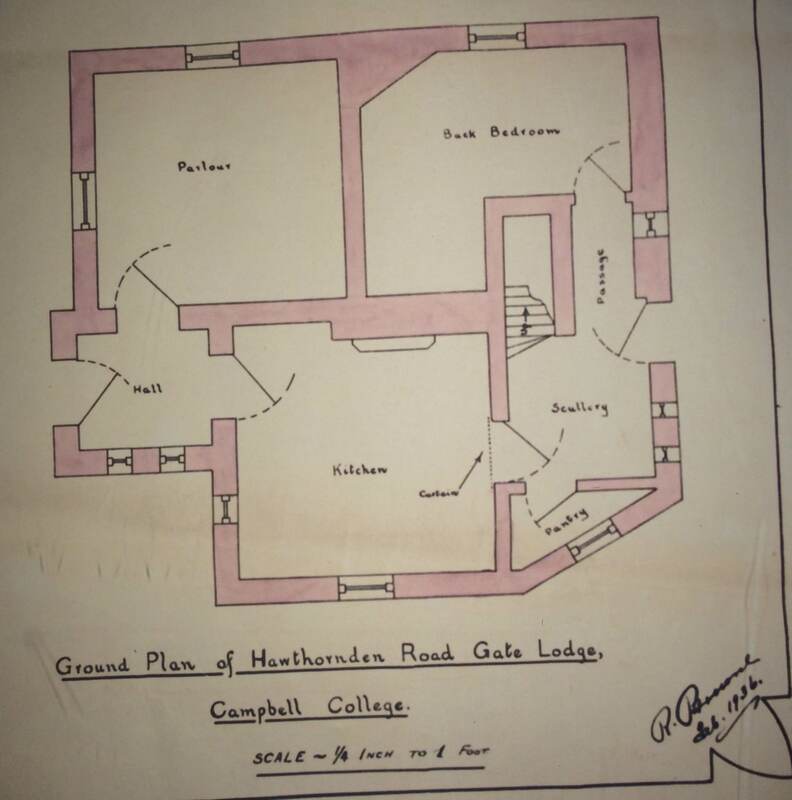 Map showing the position of RUC Constables Hopper and Hay relative to the gate and gate lodge. From trial documents. At this point, more RUC men arrived on the scene. RUC Sergeant Connolly, Constables McTavish and Massie and had been nearby at Ormiston Castle, on the other side of Hawthornden Road, 200 metres southwest of the gate lodge. On hearing the shots the RUC men moved towards the gate lodges and closed to within about fifty metres of the gate, just as the IRA raiding party apparently split in two at the Belmont Road junction. Some of the IRA volunteers were now heading towards the city centre via Belmont Road whilst others were heading away from it. Connolly later claimed 20-25 shots had been fired at them in pursuit. He, McTavish and a third RUC man got close enough to apprehend Edward McCartney who appears to have paused and was later claimed to have been considering confronting, or firing on, the pursuers. Given the distances involved, it appears that McCartney turned the wrong way in Belmont Road and, realising his mistake and that he was alone, tried to double-back only to run straight into the pursuing RUC men. When the RUC men managed to overpower McCartney he was found to have a loaded Smith and Wesson revolver in his pocket. Five minutes or so had elapsed since the scream in the gate-lodge. McCartney was now a prisoner of the RUC. They took him back to the gate lodge where he was met with the image of Hay, bleeding from numerous wounds and still sprawled on the couch. A search seemed to confirm that was no trace of the IRA volunteers in the vicinity. Not was there any trace of bloodstains despite Hay believing he had shot one IRA man point-blank. Eventually, Hay was brought off to be seen to at the Royal Victoria Hospital. The RUC then took McCartney to an RUC barracks. Meanwhile, the other members of the IRA team, including Hugh Keenan, Sean McCaughey and Peter Fanning had got away. Keenan had the presence of mind to wait at a tram stop and was even searched by the RUC as they combed the area immediately after the raid. RUC searches and raids began straight away on the Friday night. Next up, the trials …. An IRA report on the raid was later captured and read out in court (eg see Donegal Democract 6.6.36). Belfast was part of Ulster No 1 Area (which was effectively the Belfast Brigade area). See http://www.seanreidsociety.org/SRSJ3/3.16/William%20Hope.pdf for more on Hope and pipe music in Belfast, Antrim and Derry (article from The Seán Reid Society Journal, Vol 3. 2009). Hope and his family are recorded in King’s Road in 1911. See Harry (Uinseann MacEoin 1985, p.39). Jim Johnston, on the Belfast Battalion staff as recently as 1933 and described by Harry White as being a member of a shadow battalion staff that filled in during crises, trained the Craobh Ruadh pipe band (see MacEoin 1985 Harry, 41). The connections between Hope and various IRA and Cumann na mBán figures are certainly noteworthy. This account is based on the statements given by Jean Getty and Billy Hope to the RUC and the various statements given in court by the RUC and reported in the press (see below). Where contradictions appear, the exact source is identified. Billy Hope and Jean Getty say the volunteers didn’t return via the kitchen. Hay says the door was barred from the inside. Clearly there is a discrepancy in the eye witness statements here. The obvious explanation is that Hay locked the door, forgetting he did so in the confusion. This entry was posted in 1930s and tagged Billy Hope, Campbell College, Eddie McCartney, IRA, operations. Bookmark the permalink. The Campbell College raid trials, 1936.